Hello. 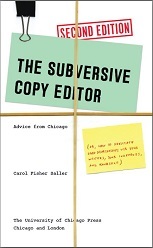 I’m Carol Saller, editor of the Q&A at The Chicago Manual of Style Online and author of The Subversive Copy Editor. After twenty years of reading letters to the Q&A, I know a lot about what’s bugging writers and editors. Today I’m going to talk about the top two causes of grief for copyeditors—and every time I say “copyeditor,” I hope you’ll take it as shorthand for office worker, teacher, student, assistants of all kinds, and basically anyone who either reads other people’s writing or who writes material that somebody else reads. So . . . the number 1 cause of grief among writers to the Q&A? It’s the tendency to insert our egos into the negotiation of copyediting issues to the point where our relationship with a writer becomes adversarial. In copyediting, there should be very little room for ego, but I know from reading the mail over the years that when it comes to our editing decisions, it can be very, very difficult to be flexible, when that seems to mean sacrificing everything we believe in. When we know a rule and have taken pains to impose it consistently throughout a document only to meet with the writer’s resistance, our instinct is to go down fighting. It’s a matter of honor. Of professional pride. And maybe even, just a little bit, of power. The very wording “my writer or boss, or colleague insists on” in an email to the Q&A suggests a battle of wills. What these writers fail to understand is that style rules are often by nature arbitrary, which means that they’re also often optional and changeable. And although grammar is generally more strict and less negotiable than style, even grammar rules evolve. Quite a few of our favorites (like the prohibition of split infinitives or a preposition at the end of a sentence) have never been more than mere superstition. Which brings us to the number 2 cause of grief among writers to the Q&A, and that is, the inability to identify the difference between negotiable matters of style and non-negotiable matters of standard English. Not only are there many different and competing sets of style rules, but they are different for a reason. Style rules serve purposes that aren’t necessarily applicable to every kind of writing. Newspapers use Associated Press style, which is different from Chicago style, because their readers and their print formats require a different approach. APA, MLA, Bluebook—each style guide was created to serve a special readership. Even within a style, there is change. The style guidelines in CMOS change from one edition to the next when they are no longer helpful to writers and editors because of changes in language or technology or even culture. For instance, the campaign to allow the pronoun they to be used as a singular (as in “Each employee must record their own use of supplies”) is in response to a cultural dissatisfaction with the use of the masculine pronoun to refer to both men and women (as in “Each employee must record his own use of supplies”). The point is, our style guides—and many of the rules we learned in school—were created to make it easier for us to handle the minor details of prose styling the same way every time for the sake of consistency. We do this not simply for the sake of doing it, but to give our readers ease and confidence in the writer’s competence and to get rid of blemishes that distract readers from the content. Although there are certainly some style conventions that are just as iron-clad as the most accepted grammar and syntax rules, on the whole, style is far more negotiable than is commonly believed. In our replies to the Q&A mail, we often find ourselves reminding readers that if a writer has a preference you can tolerate, you should consider doing so. If you believe that a style is inappropriate for a given document, you can make your arguments and hope that the writer will see reason. But if you appreciate that the writer is working from their own knowledge base—their knowledge of the content, and their knowledge of the intended audience—in a way they believe will serve their imagined reader, your response to their work can reflect that same spirit of advocacy. If you’ve equipped yourself well by mastering your craft, you’ll know how to negotiate the editing and you’ll know the most efficient route to carrying out the revision. You will have the flexibility to respond generously. And therein, you know, lies the challenge in what we do. The challenge—and the joy. In my next podcast, we’ll take a closer look at how we make trouble for ourselves and what we can do about it. Today I’m going to talk about how bad editing happens to copyeditors—and every time I say “copyeditor,” I hope you’ll take it as shorthand for anyone who either reads other people’s writing or who writes material that someone else reads. When I talk about the kinds of trouble we get into when we mess with other people’s prose, I like to identify the sources of trouble in terms of knowledge and skills, or rather the lack of them. I sometimes categorize editing failures in two basic ways: we cause trouble, first, by editing when there’s no need, and second, by not editing when there is need. Why do we edit when there’s no need? Well, first of all, everyone knows that copyeditors are rule-oriented. We’re brought up that way. We spend our whole young lives in school learning rules. Our parents teach us rules. We might have a religion with rules. We live in a civil society under laws. Our workplaces have rules. This is generally a good thing. We put up with rules to have order instead of chaos. And rules are good in copyediting, since the whole point of copyediting is to impose order and consistency and therefore credibility and readability on a manuscript. We also know that copyeditors are meticulous, if not compulsive. We notice when something’s out of place or undone. And we’re bothered by it. And copyeditors are patient. We aren’t necessarily put off by large, mindless tasks—some of us positively enjoy them. And some of us feel compelled to do them whether they really need doing or not. We edit when there is no need. On the other hand, not everyone who is charged with making editing decisions has enough knowledge or skill to edit when there is need. They don’t have enough general knowledge to recognize that just because something is unfamiliar or unusual doesn’t mean it’s wrong. When you’re evaluating someone else’s written work and you come across something unusual, if you are inexperienced generally or if you are ignorant of that particular topic, the best thing you can do is . . . nothing. The first rule of copyediting is “Do no harm.” Develop some self-awareness in this. Learn to recognize and accept the situation where you have no idea what you’re doing. Don’t pretend you do. Assume the writer knows best; query if you like; but don’t wade in and start messing with what might be just fine if left alone. Here’s an example. Someone I once supervised changed all the occurrences of the German term ur (as in “ur romantic”) to un (as in “unromantic”). This is a pretty obscure term that I certainly didn’t learn as a youngster— but what shocked me wasn’t the error—it was that this young worker had the misplaced confidence to make those changes, and that the repeated use of the word did not deter her. Unfortunately, academe thrives on stories of inexperienced but fearless copyeditors. Living on a college campus, I have suffered through more than one dinner party where telling such tales was the main sport. It’s clear that lack of knowledge combined with self-confidence is a deadly weapon. Of course, ignorance is a natural and understandable stage of learning how to copyedit, and it happens even to highly experienced editors. If you run across something that puzzles you, that’s nothing to be embarrassed about; you deserve credit for recognizing something that might also puzzle other readers. Now you just have to find out what it means and whether it needs fixing. This is good—it’s how learning happens. When I’m not sure of something, I ask someone or google it. My advice here is always to ask; don’t neglect the editing just because you don’t know. A second way someone fails to edit when there is need is when someone knows a solution but doesn’t know how to execute it. For instance, if a table or figure in a report is difficult to make sense of, it might need to be reorganized. Or if a long list of names is not in any particular order, you might need to alphabetize them by surname. In some cases, such as organizing that table, you’ll probably have to request revisions from the writer. In the second case, would you know how to automate the alphabetizing? If not, well, you get my point: lacking certain skills, we are sometimes unable to do editing that is needed. And the results? Well, they’re fairly predictable: We end up battling with our writers. You’ve probably found, like I have, that once a writer loses confidence, they just start rejecting everything you’ve done, which is unfair and maddening. And let me inject a little cheap psychology here: when a writer starts rejecting our editing, our egos become involved. We start to think of the writer as “difficult.” We get defensive. We might resort to citing rules and being inflexible about them. This dynamic can end up infecting future interactions with that writer. And if the writer really is difficult (because, let’s face it, sometimes even when we’re doing our brilliant best, there are writers who resent the least interference with their work), well, then, you’re simply doomed. We can also damage relations with bosses and colleagues, even if they didn’t write the text we messed up. For starters, we cause extra work. More than once, I’ve noticed problems with a freelancer’s word-processing and had to spend a lot of time cleaning it up myself before sending it to the typesetter; I’d be lying if I said it didn’t affect my opinion of that freelancer and make me less likely to hire them again. And I’m not without fault: not that long ago, my own carelessness in coding a manuscript led to problems with the design specs, and the designer had to redo them. Even worse, in some cases like this, we end up making a colleague—or god forbid, our boss—look bad, which is a brilliant way to ruin a good working relationship. When we edit badly, we are inefficient and frustrated. Inefficient, because when we edit unnecessarily and do tasks the hard way, we waste time. Let me give you an example: one of my freelancers who was working on an ancient history text changed all the roman numerals in the citations of classical texts to arabic numerals, in the volume numbers, in the in-text citations, in the bibliography. Although technically she was correct in following Chicago style, there were hundreds of these citations, and they were in pretty good order to begin with. To make changes like this on such a massive scale simply isn’t a good use of editing time. A particular publication might require arabic numbers, but in that case the editor should investigate sending it back to the writer for revision rather than do all that work. So not only did the freelancer waste time—and, of course, money—she was needlessly frustrated by what she saw as an endless, tedious task. And here’s the kicker to my example: in her boredom and inattention, she ended up introducing errors into the citations. The writer was understandably peeved. Next, need I point out the bottom line? Taking the time to do tasks manually instead of automating them costs time and money. If my coding error hadn’t been caught at an early stage, it would have cost extra to correct it after typesetting; if it hadn’t been caught at all, it would have produced a poor product for the reader, which could have resulted in poor reviews and lower sales. And of course this is all certainly very discouraging. So another potential cost of bad editing is low morale for everyone involved. But as I like to say, there should be no crying in copyediting. So how do we stay out of trouble? I’ll talk about that next time. Today I’m going to talk about how we can prevent bad editing—and every time I say “copyeditor,” I hope you’ll take it as shorthand for anyone who either reads other people’s writing or who writes material that someone else reads. So let’s take another look at the copyeditor’s two main causes of grief and see what to do about them. As you recall, the first was our tendency to let our editing negotiations become adversarial when we’re unable to keep our egos in check. I’d like to talk about several tactics that not only help us avoid trouble in the first place, but also come in handy when trouble happens anyway. First, there are what I call “the three virtues of the enlightened editor”: carefulness, transparency, and flexibility. In this podcast, I’ll talk about carefulness—that is, being careful both in editing and in our relationship with the writer. Care in editing requires knowledge and skills. There are several kinds of knowledge that contribute to careful, collaborative editorial work in addition to copyediting skills. The most important type of knowledge involved in producing great copy is the writer’s knowledge of the subject, which we must respect and defer to as a sort of default position. The writer also has knowledge of the intended reader, which helps determine the right tone of a document and its level of difficulty. Editing doesn’t mean forcing copy to speak your language and at your level of understanding. Your appreciation of and acknowledgment of this can be very helpful in getting along with a writer. Next, there’s your own learned knowledge, which will vary from person to person, such as formal education, job training, or foreign language skills. In editing, you bring all that to the table. When my own book was out for peer review, one of the readers drew on her knowledge of the wider editing community to ask whether I could open up the book to a broader audience by de-emphasizing scholarly publishing and including examples from journalism and trade publishing and the corporate world. I am so grateful to her! Her comment is probably one reason I’m talking to you today. One critical area of your own knowledge comes from your experience as a reader. The best editors are great readers. They have an ear for prose, an appreciation of different voices, a huge vocabulary, and a knowledge of literary allusion and wordplay. I can’t overemphasize how useful it is to simply pay attention when you read for pleasure. Frankly, I’m sometimes puzzled by questions to the Q&A that would suggest that the writer has never paid attention. I mean, how can someone believe that you are required to put a trademark symbol after brand names in a novel—have they never read a novel? The odds are, if you’re a copyeditor, you’re also a reader, but if you aren’t in the habit of reading for pleasure, and paying at least a little bit of attention while you do, this is the time to start. In addition to all these kinds of knowledge, you must gain copyediting skills, including being able to write well, reason well, and make editing suggestions in a tactful way, and of course you need skills in word-processing and negotiating. In sum, to take care with someone else’s writing, you have to know your stuff. Until then, you must use a very light hand in editing. While you’re taking classes or learning from your colleagues, my best tip for learning how to copyedit is to read your manual—and continue to read it. This is how to accumulate those little mental red flags that signal you when it’s time to look something up. You don’t have to know whether the name of a movie takes italics—you just have to hear a little bell in your head when you come across the name of a movie so you know it’s something to check. My second best tip for learning how to copyedit is to find a mentor who will check your work. I know it doesn’t always feel like a plus when someone looks over your copy and finds fault with it. Let’s face it, it can be humiliating. And if the person doesn’t really know any more than you do, or worse, if they know even less, the experience can be infuriating. But try to tough it out. Resist arguing the points and defending yourself. Some day you’ll realize that the trauma of these little humiliations had the effect of searing the style issues into your memory. Decades later you’ll probably get all choked up and nostalgic about the character who first taught you how to copyedit. So let’s say you’re now a pretty good copyeditor. If you aren’t an expert word processor, become one. Nothing can mess up your work faster than carelessness at the keyboard. There are many ways to step up your word-processing skills. Read a manual, look at tech blogs, take a class, ask a colleague, and practice. You will never regret being able to simultaneously be careful and efficient in typing, coding, and redlining. And negotiating skills? Well, there is an endless library of self-help at the bookstore when it comes to manuals on negotiating, and a book called Getting to Yes1 was a great inspiration to me years ago, but there are some specific habits you can form for careful communication with a writer that will go a long way in fostering a collaborative relationship. First, it’s good to set expectations early on by making a display of your competence. This would be sort of like a courtship dance if you were a bird in the wild. At the beginning of a project, it’s smart to familiarize yourself with the content and gather one or two very specific questions, and then flash them—like colorful feathers—in an email or phone conversation with the writer. This way, the writer’s first impression of you is an attractive one. You show that your concerns are particular to their manuscript—and that you are interested in them and their work. You show that you don’t make rash decisions—you’re sensitive to their purposes. You subversively convey the idea that the manuscript the writer thought was perfect, perhaps isn’t quite, but that—thank goodness—you’re on it. This really works best if you have serious, smart questions that need to be asked up front, even if they’re just about style. I’m not suggesting that you ask a lot of questions or questions at too basic a level—you don’t want to appear indecisive or helpless or inexperienced. And I’d also warn you not to keep referring to your style book, lest you sound inflexible or rule-driven. Be careful not to make promises you can’t keep. If you aren’t in charge of the schedule, or whether the document will be in color, or how many copies will go out, refer the writer to the person who can make the decision. Offer to advocate for the writer, if you think they have a good idea. Writers love this. And try not to say no to writer requests. Even if you lay the groundwork for a no, you can always say “I’ll ask” and then do it. I once worked with a writer who wanted to change the title of his book. Negotiating this is not my job, and it’s certainly not within my power to change a title. But for some reason he kept asking me, and I kept asking the folks upstairs, and I kept telling the writer “I’m still asking” until finally I had to say the answer was no. Acquisitions said no; marketing said no. But I know the writer appreciated my support, and as a result he trusted me to look out for his interests. Finally, take care to find out the writer’s particular interests. When I worked as an acquiring editor, my mentor taught me this valuable lesson, one that is at the heart of the book I mentioned, Getting to Yes: that is, the best outcome is one where everybody wins, and if you can find out what your collaborator most wants, you are better positioned to make that happen. Maybe the most important thing for this writer is not that they get their own way in every editing dispute; maybe this writer cares more about the schedule, or the typeface, or how big their name appears under the title. The more you can learn about what makes your writer happy, the more you have to negotiate with. So . . . we’ve been talking about preventing bad editing through carefulness, the first of our three virtues, and we’ve seen the kinds of knowledge and skills that are necessary in order for us to be careful with the writing of others. Next time I’ll talk about preventing bad editing with virtues 2 and 3: transparency and flexibility. 1. Roger Fisher and William Ury, Getting to Yes (New York: Arrow Books, 1997). In this podcast, I’m going to talk about more ways to prevent bad editing—and every time I say “copyeditor,” I hope you’ll take it as shorthand for anyone who either reads other people’s writing or who writes material that someone else reads. Last time, I covered the first virtue of the enlightened editor: carefulness. The second virtue is transparency, by which I mean honesty in communication. We’re honest in that we make our editing transparent—visible to the writer—because copyediting should be collaborative, not unilateral. And we’re honest in making decisions based on what’s best for the reader, not on the basis of our own preferences or skills. The most obvious form of transparency is to make all your editing marks visible on the document, and if you’re editing electronically, to resist the temptation to hide certain changes from the writer. But transparency as I see it goes beyond the actual work of marking corrections, and extends to your relationship with a writer. For instance, you can prevent unhappy surprises by asking before you make a major change throughout a document. An assistant in my office once proofread some tables for me and changed the styling of all the inclusive numbers—I don’t even want to think how long it took her. Although the writer’s styling didn’t match the style in the text of the book, this was in the days before we had a macro for Chicago’s inclusive number style, and I had decided to live with them. If the young woman had only asked me, I would have saved her the trouble. All she accomplished was to introduce the risk of errors and the certainty of expense. I ended up transferring her few legitimate corrections to a clean set of proof and ignoring her style changes. I too have learned the hard way to “ask first,” and it seems I have to relearn it every now and then. One early instance of this was when I lowercased in a book manuscript all the instances of He and His and Him where they referred to God. The writer made me put the uppercasing back, and there was no way to do it except to search through the original manuscript for all the uppercased He’s and His’s and Him’s and fix them one by one. And if you think about it, there are a lot of those in a typical MS, and most of them don’t refer to God. That story lets me segue into my second point about transparency, which is, if you fail to ask before you leap, then at least work in a way that allows you to undo something later without much pain. This is one way that transparency works for you as much as for the writer. Transparency is reassuring to a writer; it fosters trust that you won’t furtively impose your styling preferences without giving them a chance to object. And if you form the habit of explaining your editing now and then—in comments or footnotes—it builds trust in your judgment and skill: it shows you aren’t meddling for no reason. Of course you don’t want to overdo it; rather, explain only when you think the editing is based on subtle reasoning that the writer might not get. Finally, don’t sneak. Stealth editing really is a kind of stealing, and it’s a form of arrogance, an attitude that you know best and that the writer’s review is a kind of meddling. Sneaking also reveals an editor’s insecurity: if you’re confident of your editing, you should be willing to display it. In addition to practicing carefulness and transparency, we’re going to foster a good relationship with the writer and prevent trouble by means of a third virtue . . . we’re going to be flexible. What this means is—brace yourself—we’re going to stop looking at our style rules as some kind of holy writ, and inasmuch as we can, consider whether imposing them is useful and sensible when it means alienating a writer or causing ourselves a lot of work. Flexibility requires a willingness to listen and possibly bend the rules in the course of our collaboration with the writer. In collaborating, we are not slaves to the rules. We can use judgment when imposing them. If we’re flexible, we can pick our battles. Let’s say you’re reading a report for a colleague or your boss, and you know from experience that there might be some resistance to your suggestions. And yet you see that the writing needs work—there are grammar goofs, or lapses in logic, or the data tables don’t show what they claim to. In cases like that, rein in your compulsions, and concentrate on the things that matter. Think twice about pouncing on minor and arbitrary style lapses like capitalized presidents or roman numeral page numbers or tables with vertical rules. Just let them go. It should be obvious that knowledge and skills are essential to flexibility. Take word-processing: Knowing lots of word-processing tricks, you’ll be able to tackle editing tasks you wouldn’t otherwise. You’ll work faster, your documents will be better prepared, and you’ll have the flexibility to accommodate a writer or client who requests complex editing. Need I add that you’ll enjoy your work more? There’s really no down side to becoming an expert word processor. Likewise, knowing your style manual, you’ll understand why a rule exists and therefore have a better understanding of when it’s OK to break it. For instance, if a style rule was made purely to prevent confusion, and in a particular case you’re working on there’s almost no possibility of confusion, then your knowledge will give you the flexibility to abandon that rule in that case. Expressing your flexibility is also a good idea: it can impress and reassure a writer. When I make a change that I anticipate might be controversial, I present my reasoning and conclude with “But we can discuss it if you like.” That way, you give a writer a degree of power in the matter and a graceful way to accept your changes without it becoming an issue of who is right or who is stronger. Unfortunately, there are occasionally people who will make trouble over almost anything you suggest. Next time I’ll talk about working with difficult people. Today I’m going to talk about editing difficult writers and working with difficult colleagues—and every time I say “copyeditor,” I hope you’ll take it as shorthand for anyone who either reads other people’s writing or who writes material that someone else reads. At times, you’re going to encounter someone who simply does not want to be edited. If you’re lucky, this will be an occasional thing; in the worst-case scenario, this is your boss. Either way, you’ll have to summon all your best practices to get through the experience in one piece and continue working well with that writer. Here’s my advice. At the start, run more things than usual by the writer. This has several benefits: first, it gives the writer the position of authority, which allows them to be generous. Second, it reduces their fear that you’re going to slash and burn your way through their work. Third, if you ask intelligently and respectfully, it plants the idea that maybe your editing is actually something the writer is lucky to have. Mind, I said “intelligently”—if your questions are shallow and unimportant or betray ignorance, you’ll blow your credibility right off the bat. Next, crank up your efforts to be careful. Be extra conservative in your editing. Edit mainly things that are flat-out wrong rather than making a lot of arbitrary style changes. Edit less and query more. Even if you know something runs against house style, offer the writer a choice in the matter. Write “House style is such-and-such; OK to break style?” Often enough the writer doesn’t even know house style and will be happy to follow it, given the choice. Finally, keep an eye on your feelings. Resist any power-tripping urges to impose unnecessary changes. Resist compulsion. Concentrate instead on making sure that the document is grammatical and unambiguous. Adjust your attitude if necessary, to one of wanting to make the writer look good, rather than of making yourself look good. The trick is to be blunt and tactful at the same time. For instance, say “I’m afraid readers will think you’re being sexist” or “So many people think this is a grammar error—even it it’s not, I don’t want you to look bad.” If it doesn’t do any good, at least be sure to save the evidence that you tried. Once you’ve picked a battle, if you find yourself losing on an issue that you feel is nonnegotiable—such as bad grammar, ethnic jokes, gender slurs, or patently incorrect facts, and if you aren’t the highest authority in your company, you might have to lean on whoever is. Your supervisor will have more power. Sometimes there’s a contract involved that gives the publisher the last word on matters like these. Although I have been focusing on the relationship between writers and editors, much the same approach can be applied more generally to work relationships. After all, tension that arises between colleagues is often based on a perceived negative judgment, whether it arises in the form of editorial criticism, disagreement in a meeting, an argumentative email, or a personal slight. The habits of carefulness, transparency, and flexibility work just as well in personal and work relations as they do in editorial relations. Translated, this boils down to stuff you learned in kindergarten about playing nicely. In a work context, perhaps the most important implementation of carefulness and transparency involves making an effort to resolve a difficulty directly and privately with the offending person before complaining to anyone higher up. So much workplace drama involves saving face; if most of us refused to gossip or complain about colleagues, it would go a long way toward minimizing bad feeling. If you have a chronic problem getting along with a coworker, the first step is to talk to that person. Avoid starting off with an accusatory statement: just say “I feel like we could work better together, and I’d like to talk with you about it.” If talking gets you nowhere, try seeing someone in human resources rather than the person’s supervisor. If you happen to be in a supervisory position, you have the power to set the tone for work relationships by your actions. Remember the virtues I touted before? Transparency entails checking the clarity of job descriptions and communicating your expectations. It involves tactful and timely review of job performance, and the willingness to give honest and helpful feedback. Flexibility is the hallmark of the dream employer, someone who can recognize which workplace rules are unbreakable for legal or safety reasons, and which ones can be bent when an employee’s circumstances warrant it. Carefulness entails keeping a watchful eye on your team in order to nip in the bud any negative trends you see developing. Thankfully, in my experience, difficult colleagues and writers are rare. Much more common is the difficult manuscript, or what I like to call the dangerous manuscript. I’ll talk about that next time. Hello. I’m Carol Saller, editor of the Q&A at The Chicago Manual of Style Online and author of The Subversive Copy Editor. After twenty years of reading letters to the Q&A, I know a lot about what’s bugging writers and editors. Today I’m going to talk about handling dangerous manuscripts—and every time I say “copyeditor,” I hope you’ll take it as shorthand for anyone who either reads other people’s writing or who writes material that somebody else reads. In copyediting, I like to sort the danger into two categories: the mindless task, and the complex task, each of which presents its own terrors. The mindless task is one that involves so much tedious and repetitive word-processing that there’s a danger that at some point we will lapse into a coma and make a huge mess. In The Subversive Copy Editor I lay out my four-pronged strategy for getting through a task like this. My first and best ploy is always to automate: that is, find a way to let Microsoft Word do all the work. And I don’t give up easily. I Google around; I experiment; I email people who might know a macro. If I absolutely can’t find a way to do the task quickly and safely, I consider my next ploy: to delegate. Yes, I ponder whether I can shove this puppy off onto some other poor sap. For many of us, that’s not even a remote possibility. For me, even though we have assistants and students in our office, I’m not a good delegator. I’m working on that, but most often, I’m forced to turn to ploy number 3, which is to reevaluate. Does this chore seriously need to be done, and is it worth the time it will take, or can I live with things the way they are? I might wander around and ask a few colleagues for an opinion. Finally, and only after exhausting all my other ploys, do I cave in and actually do the dreaded task myself. For a mindless task, if possible, I break it into chunks I can alternate with more engaging work, or I listen to music, or drink coffee, or all of the above, in order to remain fully conscious throughout the operation. The complex task is dangerous for opposite reasons: in this kind of task, the corrections are so tangled and tricky, there’s a good chance that something will go disastrously wrong. The last such chore I can recall was the reorganization of an illustration program where the writer’s original labels for tables and figures didn’t make sense. He had about 40 figures and a dozen tables, numbered separately, but about half the figures looked exactly like tables and needed to be renamed as such. Because each item turned up multiple times (in cross-references, in notes, in the callouts, in the correspondence about permissions, and in the labeling of the electronic files), the renumbering had to be done with complete attention and in a way that couldn’t confuse the old numbers with the new. Before I dig in on a task like that, I ask myself two questions to determine whether it’s really necessary. First, is the original actually wrong, or is it just somewhat outside the usual? Second, if it’s just unusual, is it going to confuse anyone? Sometimes a departure from convention works: If my author had labeled everything as a figure, even the tables, I would have left things alone. This is a point worth reiterating: sometimes for the sake of time and money and mental health, the best thing to do is to break the rules. But when a breach is either wrong or confusing, I can reconcile myself to a dangerous task. Once you decide to tackle a complex chore, it probably goes without saying that carefulness and transparency are our best friends. In the carefulness department, one very good idea is to save periodic versions of a document that you’re performing major surgery on. That way, if you screw up, you can go back in time and start fresh. If you choose to perform any global search-and-replace actions, do it by stopping on each one rather than as one blind blast. If you think of a tricky way to automate a step, try it out on a copy of the document first. As for transparency, the tracking feature of your word processor allows you to toggle between viewing the original and corrected versions, which can be a big help in keeping track of where you’ve been and where you’re going. Now let’s move on to two topics that are important for anyone aiming to live a good life at the office: Getting organized, and handling deadline pressures. Organization is essential for a million reasons. By keeping track of what we’ve done and when we did it through the use of lists, schedules, and logs, we’re more likely to meet our deadlines, and we’re able to account for ourselves if (heaven forbid) something goes wrong and fingers are pointing. By clearly identifying and safely storing each version of an edited document, we’re less likely to cause a disaster, and we’re better equipped to fix it when it happens. These sound like obvious suggestions, but if you ask your colleagues whether they are disciplined about following them, I’m going to predict that only a minority actually are. And when it comes to backing up our work? Another point almost not worth mentioning, except that so many fail to do it. Lists, schedules, and logs are terribly old-fashioned ideas, but the growing number of related software apps shows that they’re still critical to writing, editing, and publishing, and I use all three. I keep a short-term to-do list on my computer desktop. It’s an automatically numbered list that I can quickly rearrange in order of priority. I delete an item when it’s done. I keep it open all day. Adding an item to the list means I don’t have to clutter my mind with it. A schedule is different. Rather than focus on today’s chores, it takes a longer view of weeks or months, and typically there’s a separate schedule for each project. Many publishers provide a production schedule to their employees, but anyone can make their own schedule on paper or in an electronic calendar or spreadsheet, or with project management software. The point is to be able to see at a glance events that are approaching. At some point, you will move items from your schedules to your to-do list. Not everyone needs a log, but I find uses for mine: it’s like a diary of things you’ve already done. Something to keep in mind when setting up your lists and schedules is that you might later need to know exactly when you did what, so take care not to let finished tasks simply disappear from the record. Instead of deleting an item when it’s done, simply mark it as done and record the date. These simple tools will help you perform well and look good. They allow you to send calm and tactful queries and reminders to your clients and colleagues ahead of time instead of panicky and defensive ones after something is already overdue. They keep you aware of all your deadlines and upcoming meetings, and they alert you of when to start-in on tasks related to them. Organizing your actual work, that is your papers and your computer files, is another essential task for anyone who wants to be efficient and reliable. Since I think you probably already know the value of creating clearly labeled folders for both paper and e-files, I’ll skip several hundred pages of notes I have on that. So, let’s take stock. In this podcast series so far, we’ve seen how to avoid trouble with our writers, our colleagues, and ourselves by being careful, transparent, and flexible and by staying organized. Next time I’ll talk about keeping ourselves on track and on deadline and therefore stress-free. Today I’m going to talk about keeping ourselves stress-free—and every time I say “copyeditor,” I hope you’ll take it as shorthand for anyone who either reads other people’s writing or who writes material that someone else reads. In previous podcasts, we’ve seen how to avoid trouble with our writers, our colleagues, and ourselves by being careful, transparent, and flexible and by staying organized. Today I’m going to talk about keeping ourselves on track and on deadline and therefore stress-free, by being ruthless in learning to work to rule, even though ruthlessness is perhaps not among the qualities copyeditors think of cultivating. “Working to rule” is my phrase for giving a project the amount of work it needs and not allowing myself to waste time on unnecessary tasks. When we’re lucky, the amount of work a project needs is the same as the amount of time we’re being paid for. If that’s not the case, then something’s gotta give. This attitude is one that tends to conflict with the copyeditor’s personality: we’re driven, we’re perfectionists, and we fear that a less-than-perfect job will reflect poorly on us. But now more than ever, managers need workers who can increase production when asked. If managers have to work with a smaller budget but still have to produce the same number of pages per month, they simply can’t afford to pay for your compulsion to improve a manuscript more than they think it needs improving. A worker who can figure out how to optimize the budgeted time on a project, how to fix the biggest problems, and how to ignore the problems that don’t really matter—someone who can be ruthless and disciplined—that’s the worker every manager is looking for. So in order to fit the job to the time available, first estimate the amount of work you need to get done each hour or each day to finish a project. Second, keep track of how you’re doing. If you aren’t making enough progress, figure out what’s slowing you down and how you can economize. You might decide to live with a style that isn’t perfectly in line with yours, if it’s logical and consistent, even if it involves undoing some editing you’ve already done. If you’ve been writing long-winded queries, or taking detailed style notes, dial it back. If you’ve been going online to check the writer’s facts or find missing information, stop it. Query instead. Read faster. Consider whether you’re wasting time on tasks that you could automate, delegate, or reevaluate. And most of all, remember this: The document does not have to be perfect. The document does not have to be perfect because perfect isn’t possible. There’s no single so-called “correct” way for it to turn out. It simply has to be the best you can make it in the time you’re given, free of obvious mistakes, consistent in every way that the reader needs in order to understand and appreciate it, and as close to your chosen style as is practical. As for more general stress, if you’re freaking out over the amount of work you have, or deadlines that are piling up, the first step in reducing the stress is to identify the problem, and the second step is to do something about it. If your pileup is temporary, you might have to put in some extra hours. If an overloaded agenda is a persistent problem, ask your supervisor to reevaluate whether your workload is realistic—managers aren’t always able to keep an accurate mental tally of the amount of work you’ve been assigned, but it’s part of their job to help you handle it. Don’t whine or fall apart: just say you seem to have accumulated more tasks than usual, and that you’d like some advice about prioritizing. That word “prioritizing” is a great one: it says that you’re willing to do the work, but that you can’t do everything right now, and that you’re smart enough and responsible enough to make sure that the manager’s pet projects get first attention—if they will just identify them for you. A manager can’t argue with the point that you can’t do all the tasks at once. They should be able to say which ones can be delegated or postponed. Of course, some of you are freelancers who have to supervise yourselves. But the same concept of prioritizing applies. List your tasks and decide what’s most important: pleasing a particular client, meeting an important deadline, being able to bill for a lucrative project, or just clearing away a bunch of minor tasks that are nagging at you. Having a plan and starting in on your list is guaranteed to lower your stress at least a notch. Even better, is to communicate with clients who aren’t your top priority. It’s not fun to let them know you’re behind, but sending out revised estimates of when you can deliver is the right thing to do, and their reactions can give you important feedback on which clients are more flexible. Finally, it’s amazing how much pressure goes down when you’re able to reset a few deadlines. If you have a feeling that the root of your troubles with work lies within yourself, examine your habits and resolve to make some changes. If there are distractions in your personal life, give them attention. Take some time off, or see a therapist, or get more sleep, or talk to a friend, or work out more often. Have a life outside your work. Adapted with permission from material first presented in the Copyediting audio conference “The Subversive Copy Editor Takes Your Questions,” December 10, 2009 (© 2009, Copyediting); and from Carol Fisher Saller, The Subversive Copy Editor, 2nd ed. (Chicago: University of Chicago Press, 2016).